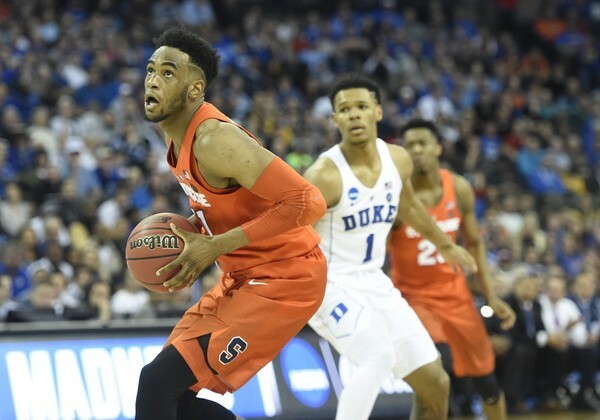 Consistency has been a problem for Syracuse forward Oshae Brissett this year. After ending the 2017-18 season as arguably the Orange’s best player, Brissett hasn’t been in that conversation much this year. His numbers haven’t been consistent enough. The second-year player had a stretch in early February where he recorded three-straight games with 12 rebounds. Since then, Brissett hasn’t pulled down double-digit rebounds in a single game. While racking up double-doubles isn’t necessarily the expectation for Brissett, we know he is capable of doing it each and every night. When he’s at his best, he’s coming close to that mark. That was the case for Oshae in the 2018 NCAA Tournament. As you may recall, he was just as reliable as Tyus Battle down the stretch of the season. Battle and Brissett gave the Orange a fierce duo on the wings, one that no coach in the country wanted to run into in a do-or-die situation. Without Brissett, the Orange probably wouldn’t have made it out of Dayton. A year ago today, Syracuse played in the first four against Arizona State and won behind 23 points and 12 rebounds from Oshae Brissett. Syracuse has played 35 games since then. Brissett hasn't reached 23 points in any of them. Check out these stat lines from Brissett in the rest of the games. Those numbers are very solid. To put things into perspective, Brissett’s tournament run was so successful one of our writers argued he’d be a bigger loss to the draft than Battle. That wasn’t that hot of a take last spring. Fast forward a year and it’s more of a stretch than it was in 2018. Regardless of last year’s takes, Brissett needs to be consistent this weekend for the Orange to have a chance at back-to-back Sweet 16’s. He’s been the topic of conversation throughout the season. Unfortunately for him, the feedback hasn’t always been positive. Here’s one thing we know: Brissett is capable of exploding on the game’s biggest stage. If he plays like he did last March, the Orange could be in for another deep postseason run.